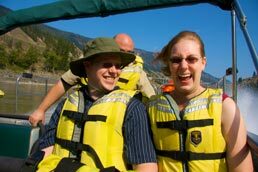 Our river tours start at our private boat launch, 15 minutes west of Williams Lake on Hwy 20. Tours go up and down river. Shuttles can be provided, please give us advanced notice when booking your tour. From the North – Prince George is 3 hours away. From the South – Vancouver is 7 hours away. 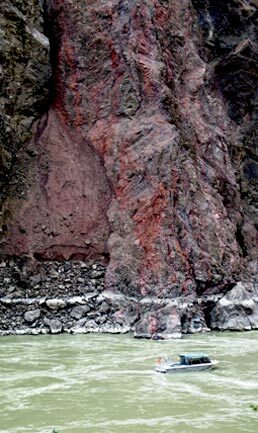 From the West – Bella Coola is 6 hours away. From the East – Kamloops is 4 hours away. Having a blast on the Fraser River. We have designed various trips to accommodate guests of all ages. Trip lengths range from 1 hour to 8 hours. We also offer overnight river camping excursions for the more adventurous travellers. Our trips require only moderate physical abilities; more strenuous activities like hiking are always optional. Our main goal is to make everyone happy and comfortable. We encourage families to join us and will take children 6 and up accompanied by an adult. Food always tastes so much better outdoors whether cooked on an open fire or on a BBQ or stove. CCJA meals provide an array of wild and organic foods and beverages. 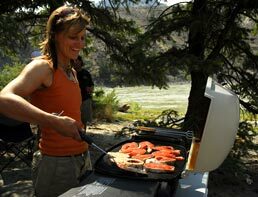 Meals are included on our longer tours and over night camping tours. Camp chairs are provided for everyone. All meals are made with fresh, local(when possible), wholesome ingredients and expertly prepared. We can accommodate food allergies, dietary restrictions and special requests. Please give us advance notice, so we can plan meals accordingly. Weather conditions will vary depending on the time of season and trip duration so be prepared and comfortable while enjoying the sun-rays and spectacular scenery.